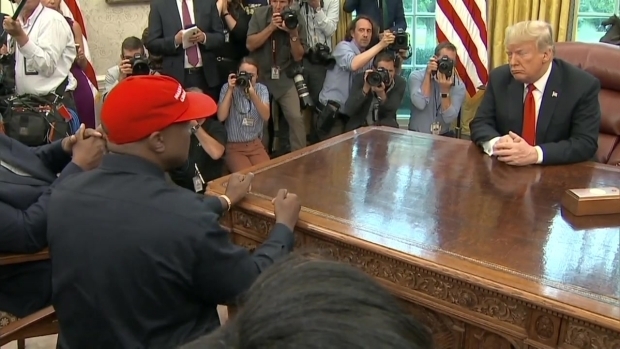 Rap star Kanye West sits down with President Donald Trump in the Oval Office and holds court on a wide variety of topics, including inner city crime, jobs for African-Americans, and the reason he supports the president. 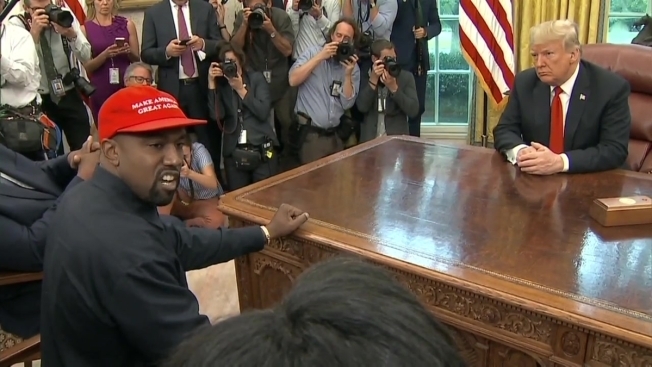 Declaring that his red "MAGA" hat makes him "feel like Superman," rapper Kanye West made a free-styling appearance in the Oval Office Thursday. Ahead of a private lunch, President Donald Trump and West spoke with reporters as they sat across from each other at the Resolute desk. West dominated the conversation with a series of monologues that touched on social policy, mental health, endorsement deals and his support for the president. "Trump is on his hero's journey right now," West said, tossing out an expletive to describe himself. West said that many people believe that, if you're black, you have to be a Democrat and said he was pressured not to wear his red "Make America Great Again" hat. But he said "this hat, it gives me power." West credited Trump with preventing a war with North Korea and encouraged Trump to swap his usual Air Force One for a hydrogen-powered plane. West also argued that Trump deserved more respect, saying: "if he don't look good, we don't look good." During a pause in West's comments, Trump said: "I tell you what that was pretty impressive." He also described West as a "smart cookie." The rapper also spoke against stop-and-frisk policing policies, which Trump recently expressed support for. Trump said he was open to other ideas. Trump recently tweeted praise for West, who closed a "Saturday Night Live" show wearing a "Make America Great Again" hat and delivering an unscripted pro-Trump message after the credits rolled. West is married to reality television star Kim Kardashian West, who pushed Trump to grant a pardon for a drug offender this year.